Why an oxymoron? Well, I have a pair of quiet corduroy slacks! 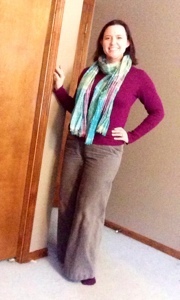 My first completed make of the year is a new-to-me pattern: Collette Juniper’s (trousers with a moderate-to-wide leg). Let me just say: J’adore! I made them from regular wale corduroy in french grey (I swear, it matches my kitties perfectly). I turned the wales 90° from usual–making them in a similar manner to Cordurounds. They consider the lining-peeking pockets a “feature” (aka “evil eye” and “side flash”) but I thought it looked kind of tacky. I omitted the back welt pockets (or, rather, didn’t draft any in) and the Juniper front pockets lie pleasingly flat. I did use a grey striped shirting for the pocket and waistband linings; the corduroy was pretty bulky. Construction went mostly smoothly. There was a little issue with the pocket/front leg matching up but I suspect a combination of operator error and fabric choice. These will be made up again in a lovely Glen Plaid (ish) that I’ve stash for just such a purpose. As for fit? Size 10 was perfect. Just enough ease to be comfortable but not so much to be baggy. I was torn on hem length: heel height or flats? In the end, I decided heel height was best. Again, the corduroy is pretty bulky and it made me look rather bulky if I didn’t have heels.